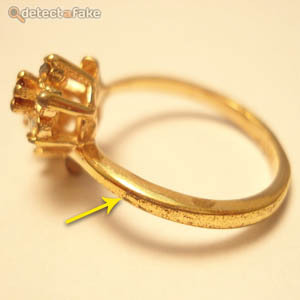 This guide is designed to help identify fake gold pieces, if you do not have any gold testing equipment. If your gold passes all the tests below, it does not mean your piece is solid gold, it is only conclusive if it spots a fake. 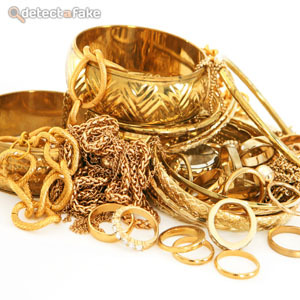 Purchasing a piece of gold without the proper testing devices is highly discouraged, but below are a few test to help determine if your gold is either not real, or it is plated. The first thing to do is the magnet test. 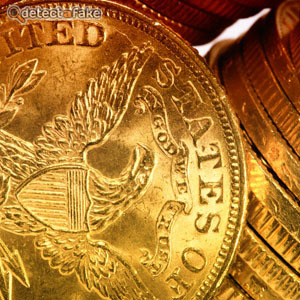 Lay your gold piece on a flat surface, and with a strong magnet, touch the magnet to the gold. If the magnet sticks to the gold at all when you move away, your gold piece is not solid. 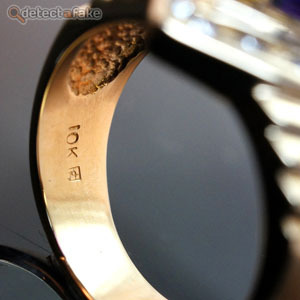 Next, with magnification, look for a stamp on your gold piece. Both of the above pictures are 10k. Notice the gold chain has "10k" and "417". Both of those numbers mean the same thing, and that's a good thing to see on a piece. Here's how the percentages work. "417" means 41.7% gold and the rest is alloys. 24k is 100% gold, and 10k is 41.7% gold. If that didn't confuse you, below is a percentage breakdown. Watch out for chains! 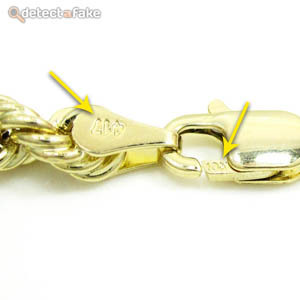 Many of the good fakes are actually real gold on the lobster claw, but the rest of the chain is fake. That's why having the stamp on both the lobster claw and the link is more assuring. Next, if it does have a stamp, look for other stamps around the "10k", or whatever k it is. 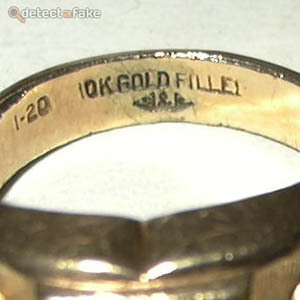 In the picture on the left, obviously it says "Gold Filled", so you know it's plated. Another indicator is the "1-20", and in the picture on the right you can see, "1/100" just before the "10k". 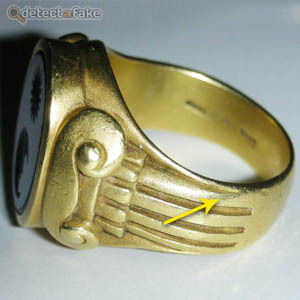 Any of these markings mean gold plated. If any of these marks are present, it's not real. 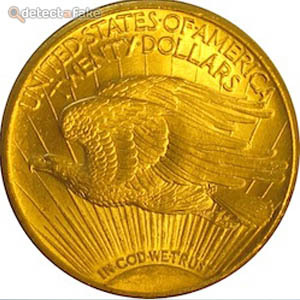 Next, if you're thinking about buying a solid gold coin, and you don't have the proper testing equipment, all I can say is DON'T! Plated gold coins look exactly like solid gold coins and this is far too much money to gamble on. The best way to test these coins is with a density tester but a good density tester will run you about $1000.00. 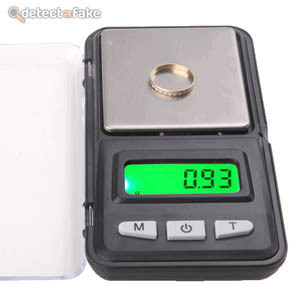 The way a density test works is to weigh a piece of gold and then to weigh it again in water. This only works if the water is not part of the weight equation. 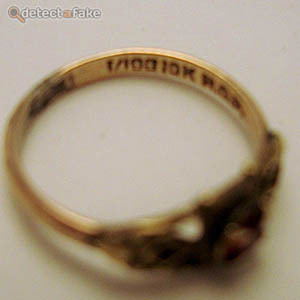 For example, you would need to weigh the gold, and then weigh it again while suspending it in the water. Difficult to do without some kind of suspension scale or a density tester.